While I was in Miami a couple of years ago, I was planning to visit Sayaka Kitchen. 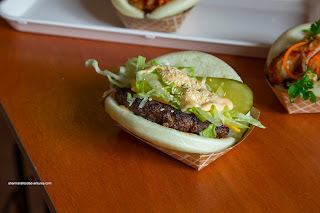 Sure, it was featured on Triple-D's and that was one reason I even knew about the place, but I was really curious about their Bao Buns (a bit repetitve as bao means bun...). Now I never made it out there, yet it made me curious as to why there wasn't something like that here in Vancouver. Yup, we can find Bao all over the place in the GVRD, however, most are authentic Asian restaurants. 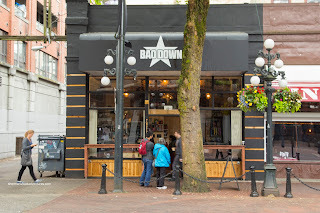 Well, look no more, as Bao Down has come to town. Meeting up with Sean, we decided to try nearly all of their Baos except for the vegetarian option (I wonder why?). To start, I tried the Jaws consisting of coconut-crusted Ocean-Wise Vietnamese catfish, kimchi tartar sauce, Food Pedalers microgreens & cabbage in a Thai Vinaigrette. I found the catfish to be prepared beautifully with a crunchy shell. Inside, it was flaky and moist. Creamy and zesty, the tartar sauce went well with the fish as well as the slightly acidic salad. Next up was the YVR with sesame-seared albacore tuna, wasabi mayo, baby pea shoots, avocado, sweet soy and double smoked bacon. As evidenced in the picture, the tuna was seared lightly, hence sporting an appealingly rare centre. It was buttery and soft which contrasted the crunchy bacon. I didn't get much of the wasabi while the smooth avocado added a certain creamy brightness. 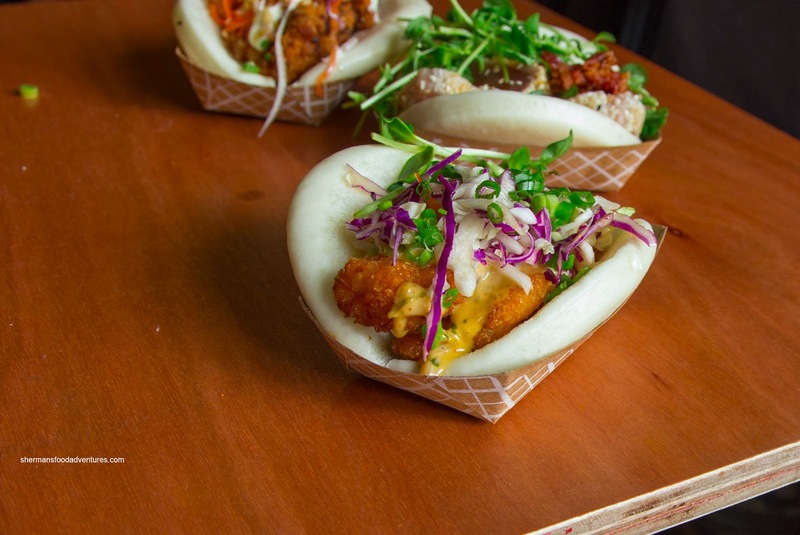 I felt this bao was missing something. 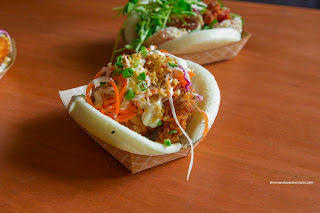 Onto something not from the sea (unless you think like Jessica Simpson), we tried the Bao Chicka Bao Bao with fried lemongrass and garlic marinated free-range Fraser Valley chicken breast, crispy garlic, palm sugar & fish sauce glaze, fresh cilantro, garlic scape mayo, pickled carrots and scallions. Hidden beneath the ingredients was a large piece of chicken breast that was neither dry nor juicy. Crispy and nicely soaked with a sweet and salty glaze, the chicken was further accented by the aromatic mayo and acidic carrots. Appropriately named, the McDowell featured some familiar ingredients such as AAA Alberta beef patty, cheese, special sauce, onion, pickle and crisp lettuce. 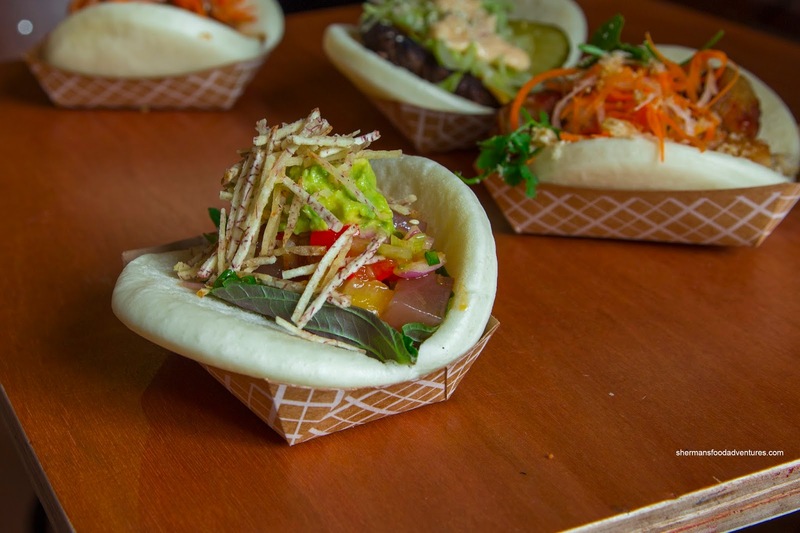 Yes, think Big Mac in bao form. You know what? It did taste like a Big Mac where the patty was well-charred while still moist. Back to the fish, we tried their other featured bao being the Mahalo with Ocean Wise tuna poke, crunchy taro sticks, shiso, BBQ pineapple salsa, avocado and jalapeno buttermilk slaw. 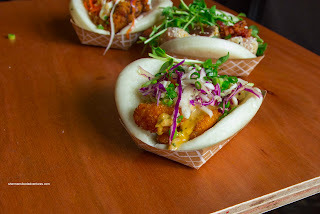 Similar to the YVR, this bao was very subtle in taste. In fact, I had a hard time discerning any flavours other than the pineapple and herbal shiso. The poke could've used a bit more soy in my opinion. I enjoyed the fresh creamy avocado though. We then moved from delicate to outright in our faces with the Two Worlds Collide!!! 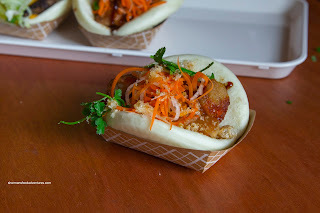 featuring star anise & ginger braised Paradise Valley pork belly, chicharon and crispy pork belly with hoisin glaze, carrots, daikon, scallions and gochujang. It was indeed a contrast of textures as the braised pork belly was super soft and fatty while the crispy belly was crunchy (albeit rather dry and hard). I definitely got the sweet hoisin hit as well as the background anise from the braised belly. Interestingly, the gochujang was not noticeable. Last but not least, we limped into our last bao (cuz we were full duh!). The Flip Side was constructed of sweet soy marinated & grilled Paradise Valley pork loin, crispy garlic, pickled carrots & radish with shoyu fish sauce dressing. I guess this was an attempt to emulate Filipino BBQ pork. Although it wasn't as charred as I would've liked, the flavours were there. 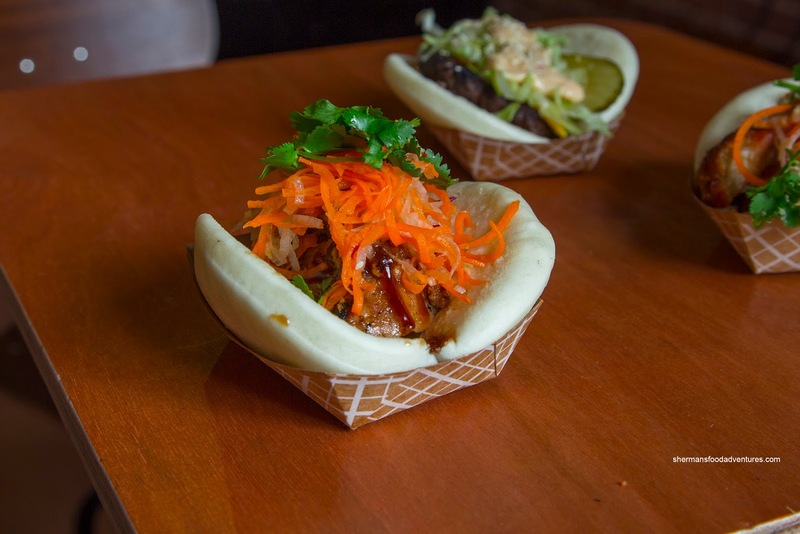 As with all of the bao, they were a bit on the lukewarm side. If they were served steaming hot, I think it would've gone a long way in achieving that pillowy soft texture associated with Chinese mantou. 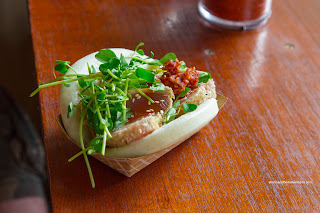 From all the bao we tried, I thought they were not bad. Of course some were better than others (and that is subjective) where the pricing was fair in my opinion. Unlike others have remarked, I thought the 90's music blaring out was on fleek (LOL) as it brought me back to my youth.